I have hated the accents that we have above our kitchen cabinets since day one. It's just not me to have a bunch of crap up there for no reason, but our kitchen just seemed so cold and industrial without it. So I've left it there with the promise to myself that I would continue looking for a new idea to replace the current arrangement. I finally found an idea that I love, on Lipstick Jungle of all places. They do have incredible style on that show, so it's no wonder that is where my idea stemmed from. I LOVE the way this looks above the cabinets... except I think I will have even more bottles than her and maybe throw in some pieces that are special to us... I have tons of beach shells, vases, candles, etc. laying around. I have had this idea for a while, but have been a bit overwhelmed as to where to look for the bottles. That is until I saw mark + lauren's post about lauren's new obsession with vintage glass. And where is she finding it, ebay of course! Duh, why didn't I think of that?! 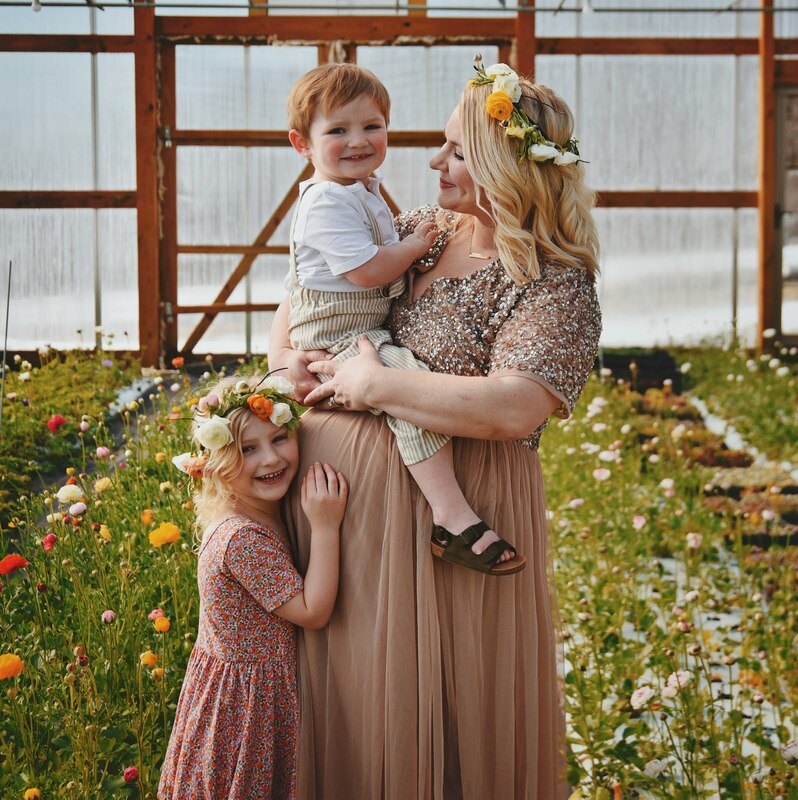 I have since been scouring listings and found some incredible pieces, however I would like to find some sort of lot that is appealing to me to save on shipping, etc. 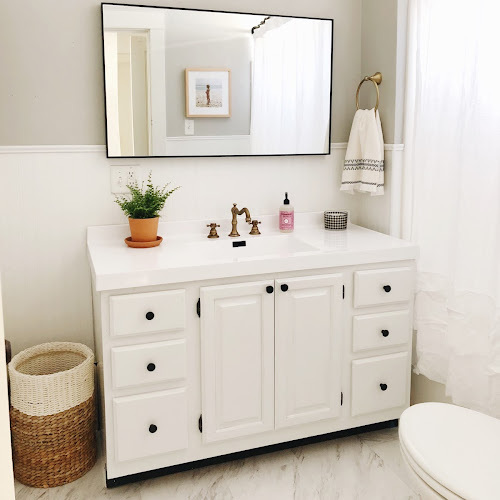 The picture below from Lauren is the look that I adore, but I definitely wouldn't try to fit this many bottles above our cabinets, haha. 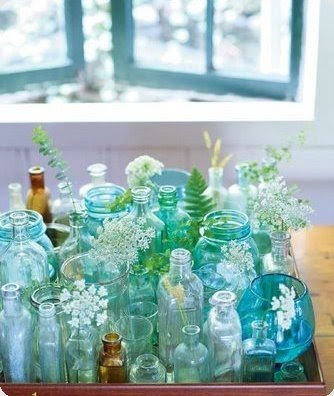 I just love this look, I would love to throw some random bottles on a windowsill or a shelf too... there is just something so soothing about them. 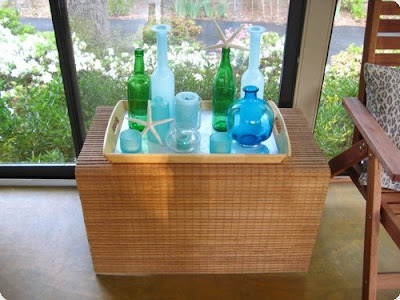 I love John & Sherry's idea too, using random bottles to spruce up their end tables for summer. It looks great! And Sherry gave me the idea to throw some old wine bottles into the mix, which I have plenty of! Thanks Sherry! I will keep you posted on this endeavor. I am off to search ebay some more! Currently listening to :: Hometown Glory by Adele.